CREATE LONG LASTING PERSONALISED MEMORIES FOR YOUR HOME. USE THE UPLOAD BUTTON BESIDE YOUR FAVOURITE PRODUCT TO START YOUR JOURNEY. IN FOUR EASY STEPS, YOU COULD HAVE YOUR ORDER DESPATCHED. Printed on 260gsm 100% polyester. Chunky frames - 38mm (1.5inch) made from pine wood. Stapled and taped on the back to create a clean and seamless finish. Ready to hang they come supplied with hangers. 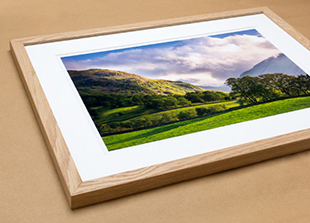 Our stunning acrylic prints are created by pressure mounting your photo onto laser cut acrylic which is 10mm thick. The acrylic glass has diamond polished edges giving them perfect clarity, this creates movement within the frame allowing light to be captured through the acrylic. We provide ourselves with a 100% money back guarantee on all our products, should you be unhappy in any way – that includes shipping! All our staff are fully trained in every aspect of the business. If you need to call us, a member of our team will deal with your order from start to finish. There is nothing worse than ordering a canvas frame from an online shop to find that when it arrives, they have used flimsy framing. Our frames are 38mm as standard. All our prints are printed using HPs latest tecnology. We use a Designjet Z3100 along with HP Vivera Pigment inks, which are specially designed to work with HP papers producing the best quality, reliability and fade resistance when using together. With over 6000 pro and semi pro photographers using our service and products, our standards are the highest in the business. All our products come with metal hangers attached, so the most taxing thing to do when you receive your canvas is open the box and choose the right spot to display it. Do you remember the pleasure of re-visiting an old memory through a personal photo-album or a personal canvas hanging on your wall? Losing yourself in the unique expressions of a personal photo-album or a personal wall canvas is a forgotten art due to digital cameras. Now, most of us simply stare at the digital versions. Nothing can replace the feeling a personal canvas offers - both to your mood and your living spaces. We are Photo4me, understand this elegant and beautiful human need of having your very own personalised canvas or a personalised photo-prints. But there is a catch. Having photos on a canvas and a personalised canvas with your favourite photos are two very different things. While the former requires a workshop, the latter requires skill, professionalism and excellent craftsmanship in the job. This is exactly what Photo4me offers you. We, at Photo4me, have a community of more than 6k members with over 500k uploaded pictures and more streaming in everyday to beautify your walls and lives alike. We turn your house into a home by bringing your walls to life with our personalised canvas prints. Our affordable online canvas printing service offers you the option of getting your personal pictures made into larger than life canvases. You can also choose from our endless catalogue of breathtaking photographs from our online gallery. We have artists and photographers who contribute to the site from all over the world. We are professionals and work with the confidence garnered from years of experience, which helps us deliver you unparalleled and supreme quality canvases. We use top quality materials printed on the best GSM cotton polyester mix with chunky - 44mm (1.75inch) frames made from pine wood, stapled and taped on the back to create a clean and seamless finish. 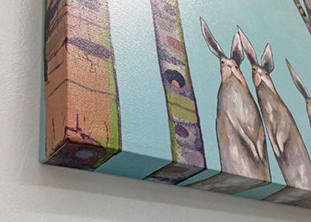 All of our canvases come ready to hang and supplied with mounting brackets. 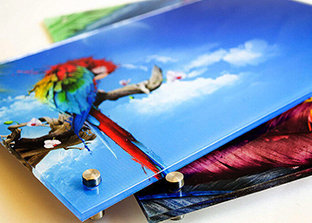 All you need to do is open the box and hang your personalised canvas on a nail or screw already affixed to the wall in your home or office. Our online order system is easy, secure and reliable. Our online canvas printing service is affordable and within everyone's budget. Our aim is to make your dream of having your very own personalised canvas come true. Our founder, Jon Pankhurst, is a passionate photographer who understood that the very nuance of photography lies in sharing photographs so that it can be viewed by one and all. Hence, we have made sure that our service is accessible to everyone. We provide online printing of your photos which you can simply upload on our website or chose from our ever expanding library and we deliver the finished printed canvas to your now personalised home. Click anywhere inside the box to select your image from your computer.